ISLAMABAD: Pakistan Tehreek-e-Insaaf (PTI) Chairman Imran Khan said Sunday that participants of the PTI rally had gathered to make a new Pakistan. Addressing the rally, Khan said that an independent judiciary would be the basis for the new Pakistan. The PTI held a rally in Islamabad to show its support for the judiciary following Prime Minister Gilani’s conviction in the contempt of court case. Imran Khan further said that the Prime Minister was adamant on saving the money of a criminal and if the orders of the Supreme Court were not implemented than the PTI would organise the largest march in the history of Pakistan. The PTI Chairman also voiced his criticism of Nawaz Sharif calling on the PML-N President to hold rallies in Quetta and Karachi if he wanted to become the prime minister. 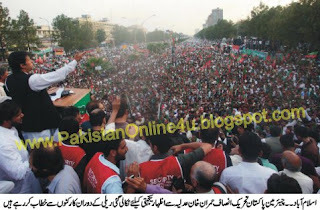 Khan announced that the PTI would hold a rally in Liaqatbagh, Rawalpindi on May 27. He called on the youth of the country to stand by him and said he wanted to ask Parliament why they passed the judgment against the Supreme Court ruling. “No one abides by your resolution,” Khan said while refereeing to the pro-Gilani resolution passed recently by Parliament. The PTI chairman next turned his attention to drone attacks, stating that if his party was in Parliament they would resign if the attacks were not stopped.